When a standard catalog item doesn’t exactly fit your application requirements, you can rely on Pneumadyne to develop a custom component that will meet your unique specifications. Our extensive fluid power knowledge and expertise will ensure an efficient product that fulfills your expectations. After evaluating system needs, Pneumadyne engineers can often consolidate components into a manifold system or valve block that eases installation, saving our customers both time and money. Component integration also eliminates potential leak points and improves the overall appearance of the circuit. Read more about a few of the custom products that have been developed for use in Material Handling applications: Liquid Pump Control, Pneumatic Lift Device. Contact Pneumadyne engineers to discuss your system requirements the next time a catalog item doesn’t quite fit. As previously mentioned, many of Pneumadyne’s solenoid valves, directional valves, blow off nozzles and pneumatic fittings are used throughout a variety of Material and Fluid Handling applications. 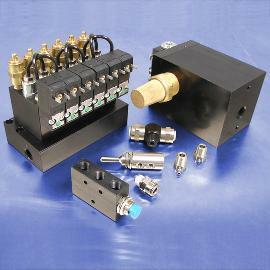 Pneumadyne offers a variety of solenoid valves to accommodate the voltage, connector and flow rate requirements of your application. Our single bases and multiple-station manifolds provide a compact and cost-effective method of mounting these valves. Several port sizes, styles and configurations of 2-way, 3-way and 4-way control valves are available for plumbing convenience. Remove dust and dirt by installing our durable brass blow off nozzles which are ideal for directing air at a specific location within a pneumatic system. Barbed, threaded and push-to-connect pneumatic fittings are available in a variety of sizes and configurations to connect the components throughout your application. The entire Pneumadyne product offering can be reviewed by clicking on the top navigation (in the gray bar above). Frequently used products are featured below.